DeviantArt is excited to announce Sketch This – daily drawing challenges encouraging artists of all skill levels to explore new techniques, emotions, and subjects with their art, while having fun interacting with the DeviantArt and SketchBook communities. 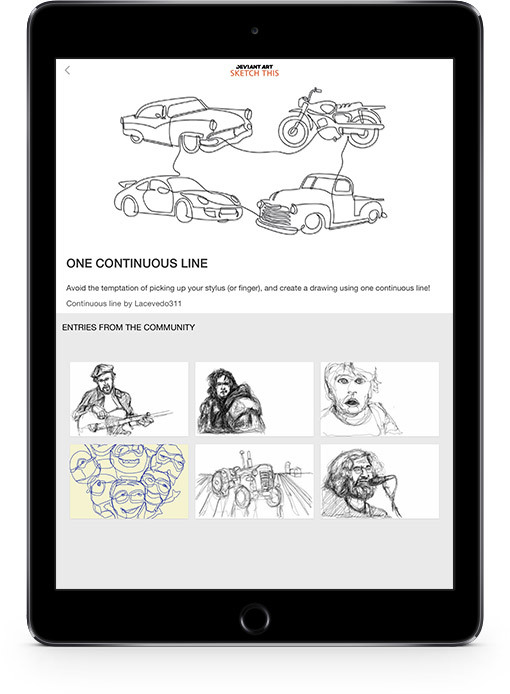 Sketch This is directly integrated inside the free Autodesk® SketchBook® mobile app for iOS and Android. SketchBook is made for anyone who loves to draw, and is an essential tool for all digital artists. Now with the integration of Sketch This, artists can easily submit their drawings directly to DeviantArt and be inspired to create something new and satisfying every day. Professional artists craft each daily drawing challenge using many art examples sourced from the DeviantArt community. With a wide range of challenges covering varied drawing styles and captivating subject matter, Sketch This is the perfect way to get in the daily routine of being creative while elevating your artistic experience. Video clips and inspiring deviations will introduce you to techniques you may not have tried before. Exciting formats like timed challenges, templates, and multi-level challenges will introduce new and intriguing ways to express yourself and extend your talents. Select from a variety of fun and engaging daily prompts! Can you finish your drawing before the timer runs out? Create a drawing starting with a pre-made template or image! Each drawing you finish will unlock your next challenge. SketchBook allows artists to capture the natural feeling of drawing with easy-to-use tools. 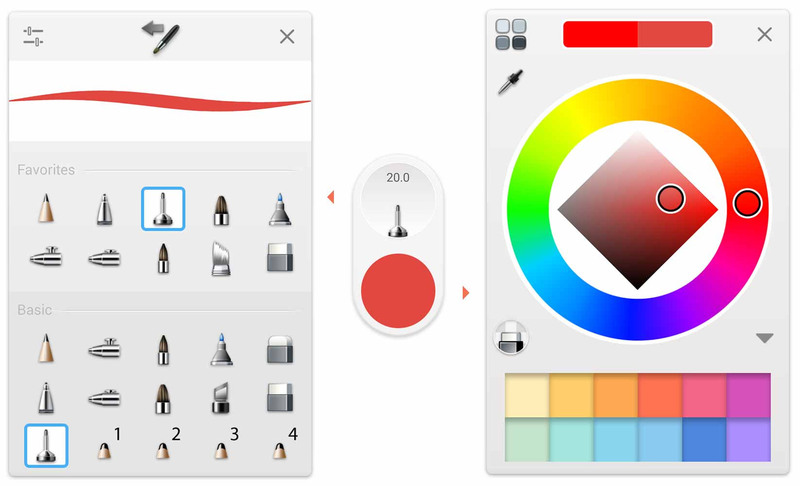 Using SketchBook, you can access a toolset of over 100 brushes, pens, markers, and pencils that deliver a powerful drawing experience on your mobile device. Customize brushes exactly how you want them – adjust brush radius, opacity, rotation, and more. SketchBook and Sketch This combine to help digital artists grow in a entertaining and challenging way. Some challenges will be basic, while others could have timers or templates. Participating in challenges provides great exposure – not only to the DeviantArt community, but also to a whole new audience of SketchBook users. When you submit your work to DeviantArt from Sketch This, your finished piece will be automatically included in SketchBook under the gallery for the challenge you completed. It also becomes eligible to be featured in special wrap-up journals on DeviantArt, as well as in social posts from SketchBook and DeviantArt. See how other artists interpret challenges by visiting #SketchThis. Have an idea for a fun challenge? Share it in the comments and it may become reality! 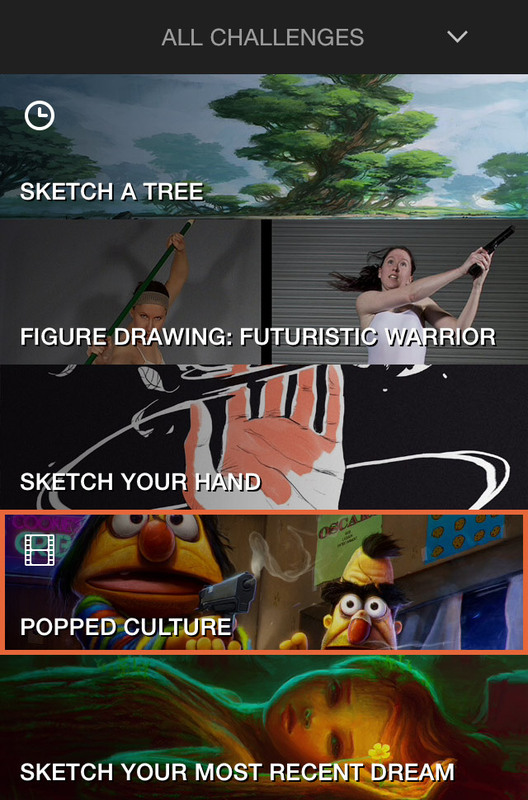 DeviantArt is excited to announce Sketch This – daily drawing challenges encouraging artists of all skill levels to explore new techniques, emotions, and subjects with their art, while having fun interacting with the DeviantArt and SketchBook communities. Sketch This is directly integrated inside the free Autodesk SketchBook mobile app for iOS and Android. PLEASE BRING IT BACK. I used to live for those. . .
What can we do to bring this back?? I"d love to use it! One of the reasons I bought note 8 was because of this feature. If i knew they remove it, I would hv buy iphone x instead. Going to assume that since it's now May of 2018, this feature isn't coming back. That's pretty lame. I have an android and it's not there,did it get taken out? I loved participating in this, but unfortunately, when my tablet died, it isn't available for the desktop version of the app - even the paid one. Could you guys please consider adding it to the desktop version? I really did love Sketch This; it's been instrumental in helping me grow as an artist. So I'm on android. There isn' t that feature anymore from the last update. So how would we do challenges? Please notify me of how to do it or when it comes back. Thanks! MAGI NATION PLZ I actually wanna see how others do. T.T They removed it. No word if and when it will come back. Can't I upload a work done the traditional way on part without using Sketchbook​? I mean is it possible to upload anything on Sketch This without using Sketchbook??? Can someone please help!!!!!! When sketchbook updated, i lost the option to do the sketch this challenges. I I've looked everywhere in the app and cant find it. Did anyone else have this happen, and how did you fix it? Is there any chance this will EVER be released to go with the desktop version? sketch this option on sketchbook is gone...help please!!!! I have Android, and I have lost the Sketch This option. Is there something special that I need to do to get it back??? With the new android update the feature is gone. Will it ever come back? I have the same problem too, any luck? No, I think it's gone. It wouldn't be so confusing if they had mentioned it anywhere. seems like some sort of an unexpected error. How about a Team Fortress 2 themed challenge? I was thinking that it would pick a random weapon or part of a map, maybe even a character, and then you would need to draw it in the span of a day. I actually really like this idea. Pity it seems to not have support for artists who are traditional artists. Omg I used sketchbook before I used DA! How do we know what each daily sketch is? Wait, do we h a v e to use the Sketchbook app for mobile? What if we like using a different app, or what if we don't even use mobile devices? What about people who use tablets? Tablets are mobile devices. Check out sketchbook. It is by far the best "art" app I've ever used. You may like it as well. You can get both apps on your tablet and you have to use the sketchbook app or it wont work. Wish that it was also for Sketchbook on Amazon, rip. I already have pro, and I love it! Just wish that I could do this, lol. There is an amazon sketchbook! I use it. How do I access these challenges? I can't find an option to look and do them in the app or a page on DA that tells me how to do it. Celebrate DeviantArt's 15th Birthday! As DeviantArt enters its 15th year on the Internet, we want to take a moment before blowing out our candles to thank the community for allowing us the honor of hosting the site that you call your home for art. After all, it's the community's 15th birthday, too, and in the past few months, we've been making it our top priority to share with you our plans for the future, celebrate the successes of our past, and look to you for guidance on how best we can serve each of you while entering this new phase of DeviantArt's existence. As mentioned in last week’s Beginnings of Site Simplification journal and the new DeviantArt Timeline, we’ve spent a lot of time thinking about how to make DeviantArt a simplified and unified experience — ultimately leading to increased participation from new and longtime deviants, adding more favourites, comments, and deviousness to the site as a whole. Because DeviantArt has been around for nearly 15 years, we recognize that the site has accumulated a number of terms, words, and names for our various features and functions — some of which have multiple or similar meanings, and many of which increase confusion around how the site works. Earlier this year, we introduced the DeviantArt Timeline, which highlights the work we’ve accomplished in the past, and lays the groundwork for the work that is to come. As we progress, we’ll update the Timeline with additions to show what’s in store for the near future on DeviantArt. This journal outlines items that have been added to the timeline today, and what you can expect to see soon. A seemingly small and very specific change, but a huge community request. We’re kickstarting the experience of joining DeviantArt by suggesting deviants to watch. DeviantArt’s User Experience and User Interface team leads a discussion about the future of profile pages. Starting today, status updates posted by deviants you watch now appear in your notifications. This has been a popular request from deviants who actively post status updates. With status updates in notifications, it will ensure that more of your watchers see your posts. Like other notifications, status updates can be viewed in list view (text only) or grid view (full thumbnails). Status update notifications can also be stacked, which groups notifications by deviant together. What Does Your Artistic Journey Look Like? DeviantArt and Wix: With a Kindred Spirit Earlier today, Wix.com announced its acquisition of DeviantArt, and I want you to know how incredibly positive this development is for our community, for the platform, and for all artists who haven’t yet become deviants! The DeviantArt Mobile App — now with millions of installs on iOS and Android — brings the DeviantArt experience to mobile phones and devices. With so many deviants using the app to upload art, browse and comment on deviations from people they watch, check their profile, send notes to their friends, we get a lot of feedback about what features deviants want to see next. Today, we released push notifications for notes, a highly requested feature and the first of many notifications on the app. When you receive a new note, you’ll receive a push notification on your phone, letting you easily respond to friends and fans even quicker. T he Deviousness Award, bestowed in recognition of exemplary membership and an outstanding spirit of helpfulness and mentoring within the DeviantArt community, has recently undergone a reevaluation to provide a focus and a re-definition as to just what Deviousness truly represents. The award is given once per month to honor a deviant who has gone above and beyond in their services to the DeviantArt Community. The 189 recipients of the Award thus far have brought something to the community that was not there before their presence, and it's our duty — and honor — to publicly recognize their efforts in doing so. We all have our way of using DeviantArt to engage and build relationships with other Deviants around art. We submit deviations and the community kicks into gear with comments, favs, shares and new watchers. But there are times when engagement is not as high, or it doesn't happen as quickly as normal. We're thinking of a place dedicated to kindred activities (engagement prompts) that you could do for the Deviants in your community. You might ask — How is that any different from how I comment, favourite and share right now? The deviations and Deviants you engage with will be aligned with the Kindred spirit of the DeviantArt community. In other words, they will be surfaced here because they may not have received the love and consideration they deserve. Getting a fave or a comment on a work-in-progress could be more valuable than waiting for feedback on the finished piece. By popular demand, the DeviantArt Mobile App now includes two new features: notes and improved notifications! Digital artist rossdraws talks about how he uses the DeviantArt Mobile App when he's away from his computer. Access your notes through the mobile app, making private conversations between you and other deviants easily accessible on the go. 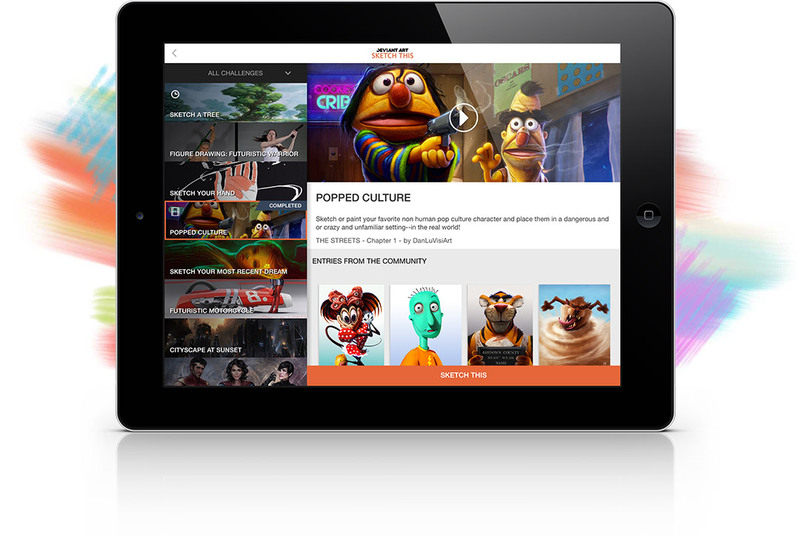 Notes are synced between the desktop site and mobile app, creating one seamless experience. Send a note, access your inbox, or view sent items – it’s all there. A common request from deviants is to post collaborative deviations, where more than one deviant has worked to create the end product. In our recent Top Community Feature Requests and Our Responses journal, we briefly addressed why we haven’t yet undertaken collaborative deviations. However, we want to open a discussion around how collaborations could theoretically work, so that we can better understand the community’s desires for such a feature. We've already put a fair amount of thought into collaborations, but don't want to make assumptions about around how deviants would use the feature to best serve their needs. From simple to complex, there are a number of ways we could implement collaborations and we’re interested to hear the community’s expectations. Introducing Sketch This: Daily Drawing Challenges DeviantArt is excited to announce Sketch This – daily drawing challenges encouraging artists of all skill levels to explore new techniques, emotions, and subjects with their art, while having fun interacting with the DeviantArt and SketchBook communities. Sketch This is directly integrated inside Autodesk® SketchBook® mobile app for iOS and Android.